UCO's Central app helps students stay connected, with practical features that complement our students' busy lifestyles. 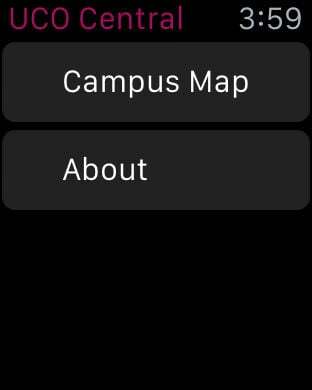 Campus Map – The building information tab allows users to see a photo and brief description of each building. 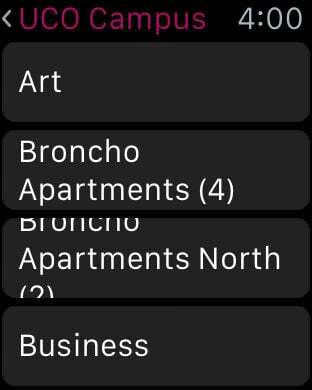 The building search function also allows users to locate buildings, which can be a big help during that busy first week of class! Courses – Not sure where you need to be today? Use this feature to check your daily schedule, or even view the full listing of courses. Learn@UCO – Access online class information. Calendar – Access the university calendar for a full listing of campus and community events. My Parking – Order your parking permit for the year at the touch of a button. Social Media – Connect with us on Facebook, Twitter, iTunesU, and more. Faculty Directory – Search the directory to find contact information for your instructors. Users can also use the Central app to check grades, find important phone numbers, and more.